← Final JetBrains Be Wiser Party Preparations are Under Way! As you already know, we are working on GSP editing improvements in IntelliJ IDEA X. 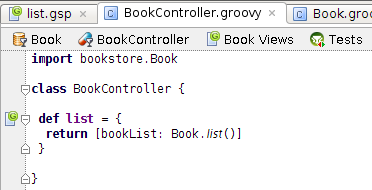 In particular, now the editor knows about the variables that the controller supplies to the view. Rename, completion and find usages work as they should. This entry was posted in New Features and tagged Grails, Groovy, GSP, ideaX. Bookmark the permalink.